Organisations without a listed signatory will receive the message below upon logging in. A signatory is required so organisations can accept the CJSM terms and conditions annually. You can complete this by logging in and clicking on the ‘CJSM Terms & Conditions’ link in the banner or by navigating to the properties tab for your organisation. 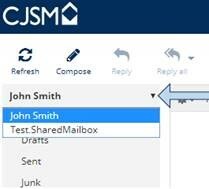 To access shared mailboxes, click on your name located on the left hand side above your Inbox folder. If you are unable to login, click “Can’t login” located the under the login button. If you're unable to answer your security questions, please contact your local CJSM administrator. If you are the nominated CJSM administrator please contact the CJSM Helpdesk by emailing cjsm.helpdesk@egress.com or phoning 0207 604 5598 between 08:00 and 19:00 Monday to Friday.